2 1/2 x 4 Customized Rolled Scroll | Customized Scrolls | Scrolls Unlimited, Inc.
--- Please Select --- Yes! I want the edges burned on the sides of my scroll! Please do not burn the sides on my scroll! Do you have something short and sweet to say? 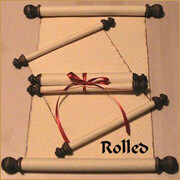 This size "Customized Rolled Scroll" measures 2 1/4" wide by 4" long. These scrolls come burned on the sides to give them an authentic"Old Fashioned" look. A great way to invite someone to dinner! A short poem you've written for someone. Use on a special gift! A great way to make a proposal! Add a little fancy by using one of our Fabric Bags for an added impression. We promise you whoever gets one of these scrolls will LOVE them! Our Colored Padded Envelopes can be used for mailing your Customized Rolled Scroll. Make your presentation and keepsake extra special by presenting in one of our wood Rolled Scroll Storage Boxes. A "Name Plate" can be added with Name and Date of your special event. Price includes the one-time set-up fee of $20 for customizing which includes the layout fee, three proofs and printing. Click here to our "CUSTOMIZED FAQ PRICE SHEET"